Charlie Bamforth, an English scientist who specializes in malting and brewing, is our guest on Brew Ha Ha today with Steve Jaxon, Mark Carpenter and Herlinda Heras. 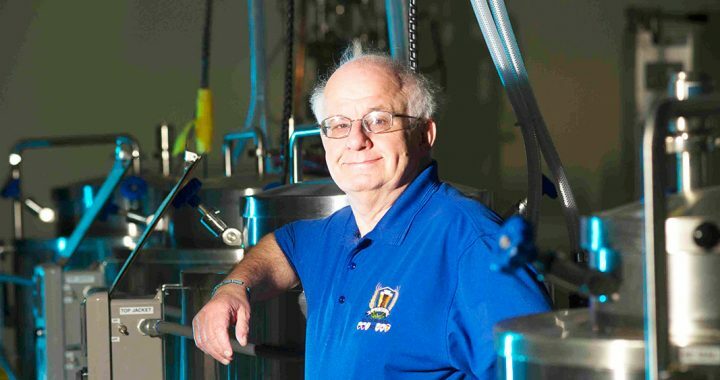 Charlie has been a professor at UC Davis since 1999, and has 40 years in the brewing industry. When he was a biochemist working on enzymes, as a post-doc student at the University of Sheffield, he found a job in his field. He has also written about the English soccer league for the English press. He is a fan of Wolverhapton Wanderers. Herlinda Heras is the coordinator of the craft beer program at Sonoma State University. Charlie Bamforth is a professor at UC Davis. He runs a summer abroad program, teaching brewing science in the UK, for college credit. They did it in 2014 and 1016 and again this year. It is based in Nottingham. They go on a lot of field trips to malt houses, breweries and hop yards. Herlinda asks about isinglass, which is a kind of gelatin that comes from fish. It is used to make beer clear. Mark says it is still used in England to make clear beer. Charlie says it is a protien, actually a collagen. The course takes place in the UK where the legal drinking age is 18 and a university student has to be in good standing. He says that the craft brewing industry today is based on English brewing practices. Herlinda mentions that she will be judging the English Pie competition in England. These pies are savory and go with beer. Charlie says that the people of Wigan are called “pie eaters” since they like it so much. They are a staple of the British diet. Steve mentions that British food gets a bum rap here in the US, but there are so many tasty recipies and Charlie agrees. Charlie tells that they’ve been teaching brewing at UC Davis since 1958. It used to be the only university beer program in the US but there is also one at Oregon State. Charlie tells that the first brewing equipment was donated in 1958 by the Lucky Lager company in San Francisco. Mark is drinking a “fresh squeezed” beer. Earlier he had a Belgian beer, Abbé du Roc. Charlie Bamforth says that if there is one country in the world where they have real reverence for beer, it is Belgium. Herlinda mentions that he used to work at Bass, in 1983. Charlie says that their red triangle is the oldest registered trademark in the world.